There are several different styles and types of metallic plated beads. Metallic plated come in several different finishes including patinas. 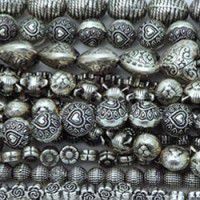 Metal beads often have a design stamped or embossed into the surface. The three dimensional surface of the design gives an artisanal flair and feel to all of your beadwork.